Python’s growing adoption in data science has pitched it as a competitor to R programming language. With its various libraries maturing over time to suit all data science needs, a lot of people are shifting towards Python from R. This might seem like the logical scenario. But R would still come out as the popular choice for data scientists. People are shifting towards Python but not as many as to disregard R altogether. We have highlighted the pros and cons of both these languages used in Data Science in our Python vs R article. It can be seen that many data scientists learn both languages Python and R to counter the limitations of either language. Being prepared with both languages will help in data science job interviews. 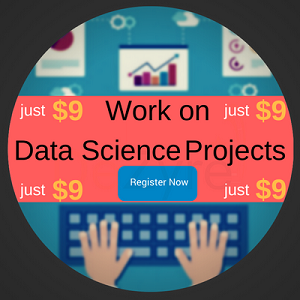 CLICK HERE to get the data scientist salary report delivered to your inbox! Python is the “friendly” programming language that plays well with everyone and runs on everything. So it is hardly surprising that Python offers quite a few libraries that deal with data efficiently and is therefore used in data science. 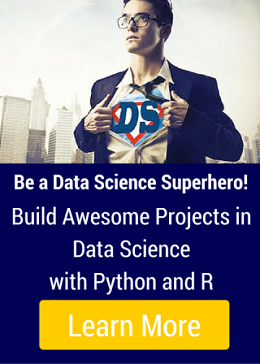 Python was used for data science only in the recent years. But now that it has firmly established itself as an important language for Data Science, Python programming is not going anywhere. Mostly Python is used for data analysis when you need to integrate the results of data analysis into web apps or if you need to add mathematical/statistical codes for production. In our previous posts 100 Data Science Interview Questions and Answers (General) and 100 Data Science in R Interview Questions and Answers, we listed all the questions that can be asked in data science job interviews. This article in the series, lists questions which are related to Python programming and will probably be asked in data science interviews. The questions below are based on the course that is taught at DeZyre – Data Science in Python. This is not a guarantee that these questions will be asked in Data Science Interviews. The purpose of these questions is to make the reader aware of the kind of knowledge that an applicant for a Data Scientist position needs to possess. 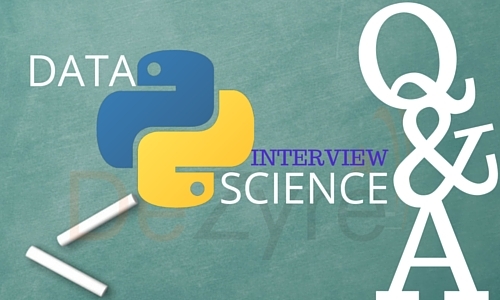 Data Science Interview Questions in Python are generally scenario based or problem based questions where candidates are provided with a data set and asked to do data munging, data exploration, data visualization, modelling, machine learning, etc. Most of the data science interview questions are subjective and the answers to these questions vary, based on the given data problem. The main aim of the interviewer is to see how you code, what are the visualizations you can draw from the data, the conclusions you can make from the data set, etc. 1) How can you build a simple logistic regression model in Python? 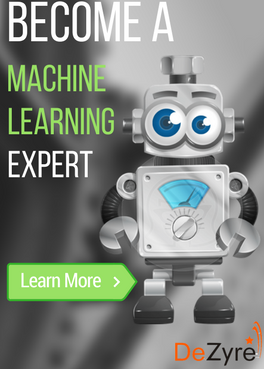 2) How can you train and interpret a linear regression model in SciKit learn? 3) Name a few libraries in Python used for Data Analysis and Scientific computations. 4) Which library would you prefer for plotting in Python language: Seaborn or Matplotlib? 5) What is the main difference between a Pandas series and a single-column DataFrame in Python? 6) Write code to sort a DataFrame in Python in descending order. 7) How can you handle duplicate values in a dataset for a variable in Python? 8) Which Random Forest parameters can be tuned to enhance the predictive power of the model? 9) Which method in pandas.tools.plotting is used to create scatter plot matrix? 10) How can you check if a data set or time series is Random? 11) Can we create a DataFrame with multiple data types in Python? If yes, how can you do it? 12) Is it possible to plot histogram in Pandas without calling Matplotlib? If yes, then write the code to plot the histogram? 13) What are the possible ways to load an array from a text data file in Python? How can the efficiency of the code to load data file be improved? 14) Which is the standard data missing marker used in Pandas? 15) Why you should use NumPy arrays instead of nested Python lists? 16) What is the preferred method to check for an empty array in NumPy? 17) List down some evaluation metrics for regression problems. 18) Which Python library would you prefer to use for Data Munging? 19) Write the code to sort an array in NumPy by the nth column? 20) How are NumPy and SciPy related? 21) Which python library is built on top of matplotlib and Pandas to ease data plotting? 22) Which plot will you use to access the uncertainty of a statistic? 23) What are some features of Pandas that you like or dislike? 24) Which scientific libraries in SciPy have you worked with in your project? 26) Which python library is used for Machine Learning? 27) How can you copy objects in Python? However, it is not possible to copy all objects in Python using these functions. For instance, dictionaries have a separate copy method whereas sequences in Python have to be copied by ‘Slicing’. 28) What is the difference between tuples and lists in Python? Tuples can be used as keys for dictionaries i.e. they can be hashed. Lists are mutable whereas tuples are immutable - they cannot be changed. Tuples should be used when the order of elements in a sequence matters. For example, set of actions that need to be executed in sequence, geographic locations or list of points on a specific route. PEP8 consists of coding guidelines for Python language so that programmers can write readable code making it easy to use for any other person, later on. 30) Is all the memory freed when Python exits? No it is not, because the objects that are referenced from global namespaces of Python modules are not always de-allocated when Python exits. 31) What does _init_.py do? 32) What is the different between range () and xrange () functions in Python? 33) How can you randomize the items of a list in place in Python? 34) What is a pass in Python? 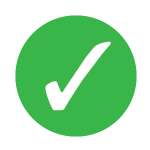 Pass in Python signifies a no operation statement indicating that nothing is to be done. 35) If you are gives the first and last names of employees, which data type in Python will you use to store them? You can use a list that has first name and last name included in an element or use Dictionary. 36) What happens when you execute the statement mango=banana in Python? A name error will occur when this statement is executed in Python. 37) Write a sorting algorithm for a numerical dataset in Python. 39) What is monkey patching in Python? Monkey patching is a technique that helps the programmer to modify or extend other code at runtime. Monkey patching comes handy in testing but it is not a good practice to use it in production environment as debugging the code could become difficult. 40) Which tool in Python will you use to find bugs if any? Pylint and Pychecker. Pylint verifies that a module satisfies all the coding standards or not. Pychecker is a static analysis tool that helps find out bugs in the course code. 41) How are arguments passed in Python- by reference or by value? The answer to this question is neither of these because passing semantics in Python are completely different. In all cases, Python passes arguments by value where all values are references to objects. 42) You are given a list of N numbers. Create a single list comprehension in Python to create a new list that contains only those values which have even numbers from elements of the list at even indices. For instance if list has an even value the it has be included in the new output list because it has an even index but if list has an even value it should not be included in the list because it is not at an even index. The above code will take all the numbers present at even indices and then discard the odd numbers. 43) Explain the usage of decorators. 44) How can you check whether a pandas data frame is empty or not? The attribute df.empty is used to check whether a data frame is empty or not. The output for the above code will be [6, 6,6,6]. The reason for this is that because of late binding the value of the variable i is looked up when any of the functions returned by multipliers are called. 46) What do you mean by list comprehension? The process of creating a list while performing some operation on the data so that it can be accessed using an iterator is referred to as List Comprehension. The output for the above code will be: ‘aeioubcdfg'. In string slicing when the indices of both the slices collide and a “+” operator is applied on the string it concatenates them. The output for the above code will be an empty list . Most of the people might confuse the answer with an index error because the code is attempting to access a member in the list whose index exceeds the total number of members in the list. The reason being the code is trying to access the slice of a list at a starting index which is greater than the number of members in the list. Argument to the function foo is evaluated only once when the function is defined. However, since it is a list, on every all the list is modified by appending a 1 to it. 50) Can the lambda forms in Python contain statements? No, as their syntax is restrcited to single expressions and they are used for creating function objects which are returned at runtime. This list of questions for Python interview questions and answers is not an exhaustive one and will continue to be a work in progress. Let us know in comments below if we missed out on any important question that needs to be up here.